@djtyme, I have the same audio setting. The time I had a situation akin to yours was when, unknowingly, I accidentally nudged the crossfader with the back of my hand to the other side, so it was complete silence. First time it happened in a gig, I thought it was the power to the speakers but after half-a-minute of checking, I realized that it was dumb me. But yours I understand happened unattended. Human error aside, it's a solid piece of equipment and, as I've said, VDJ works with it flawlessly. Hi Guys, Just got my MC7000 and loving the instant mapping for vdj. I do radio shows and record my mic as well and i have not had to touch anything to set it all up. Just one query, i noticed in the windows soundcard settings for the mc7000 that you can change the playback and recording settings to two channel 24 bit sound. I run vdj on a Windows 10 machine. For best sound and recording quality, will 24 bit make a difference. I master my own shows too and i have heard recording in 24bit can help this process. Unless you're producing and mastering your own tracks, any music you buy will be 16 bit (CD quality) and usually 44.1kHz. There's little point recording it at a higher bit rate. The quality won't improve. If you use the ASIO drivers for the Denon, then it is the ASIO drivers that dictate the format used. The windows format is only used when using WASAPI. There is no harm in selecting 24-bit either. Note that the soundcard output format is independent from the recording format. If you are doing mastering after recording, you could indeed record in 24-bit by setting recordBitDepth option to 24-bit, and recording in wav or flac format. Hi Guys, I would like to thank both of you for taking the time to answer my query, really appreciate it. Hi Guys, I am back again with a query about recording sound levels in regards to the Denon MC7000. I have just recorded my radio show but the whole show has been recorded to a limit of -15db, in other words very quiet although my mic volume has come through much louder and not limited, i would expect that. I havent change a single setting in vdj8.2 apart from record in 24 bit instead of 16 bit. I have recorded using the mc7000 in 16 and 24bit and this does'nt make a difference to the levels. When i recorded through my old mc6000 mk2 it recorded to a limit of -6db which was perfect as it gave me loads of headroom to master it and good volume. Is there anything i am doing wrong ? or is there a setting where i can set the recording level to -6db or any other level? I have tried changing the zero db option from default to other levels that makes no difference either. I have an optimized Windows 10 system with no latency issues at all on 224ms buffer. Many thanks for any help, Will. Forgot to mention, i have always had autogain remeber changes on, as i said, i have not changed any settings. Seems there is a general problem on the MC7000 & MCX8000 recording out levels, both on VDJ and Serato. Have you checked your Windows recording settings to se if they are turned al the way up? Could be an issue with the Denon ASIO drivers for the unit, and if so I wouldn't expect a fix any time soon. Denon take forever to update drivers. The one big advantage over the Pioneer controllers is that it has two dedicated mic channels. We really need an up to date compact replacement for the MC6000 though. I am also waiting for this. There is no way I would buy a 6000MK2, as they took away some of the features of the original. I also like the fact that the headphone monitor controls are on top of the unit rather than the front. The asymmetrical layout is my main reservation with the unit. In my view both Denon and Pioneer have messed up to varying degress, with their current generation of controllers. Denon have a better balance of features for the working DJ, with independent mic channels and the headphone controls in the correct place, but the quality of the transport controls aren't up there with Pioneers, and the mirrored layout was also a mistake (one they wont repeat I'm told). The problem is the fanboys and the paid off online review gurus (essentially salesmen), they create the illusion that these products are near perfect, but any kind of objective review from someone who knows what they're doing will find them way short of the mark. Absolutely agree with all the above, with the addition of: Master Balance, Sample Volume, 3 Independent Combo Mics, Filter Knobs, Volume Attenuator switch on the back, A 3 Band EQ on the Master and 3 Band EQ on the Booth. What happened to Zone features on mixers? that was good also. Funny even these bigger controllers don't have what we actually need. I personally am sick of making these fixings for the external power supplies. don't have what we actually need. LOL! That's not what you need - it's what you want :-) Three mics on a controller? I doubt the day will ever come. It's rare for even the most expensive hardware DJ mixers to have three mic channels. Many thanks for all this guys. All my volume controls on windows spund panel are 100 percent for audio and recording. I noticed that there are other line in/out channels all showing ready (i have my realtek built in soundcard disabled) i have not changed anything there. Is there absolutely no work around, I'm fuming at Denon if this is a known issue. I desperately need to do my shows, do a weekly and monthly show elsewhere and i have deadlines. If you have any other ideas please post it if you can, i really appreciate all the advice you are giving me. We have controllers with one mic channel, two mic channels, but three will never happen? I don't believe that. And I have two mixers with more than 2 mic channels. Can you not just record directly from VDJs software mixer, without needing the record input from the Denon in the audio config? That'd be the normal method for controllers that use the master/headphone config. Not sure what you mean Groove. I record through the built in vdj recorder as a wav file. Yes I know controllers with 1 & 2 mic channels exist - but there are far more with the bare minimum of a single jack input and a volume knob. Even the premium hardware is getting stripped back in that respect. 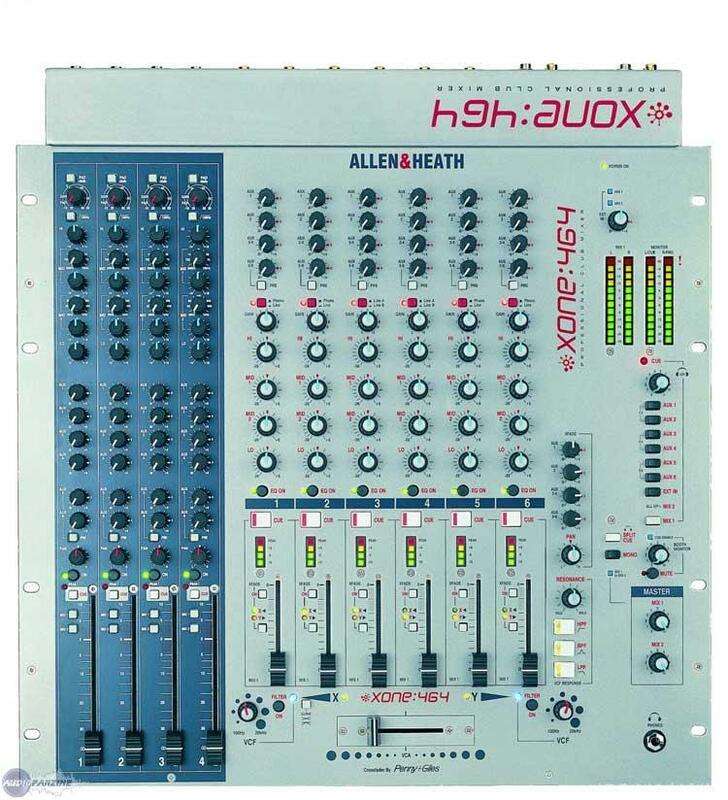 The Xone:464 that I pictured had FOUR top notch mic channels, because it was from A&H who came into the DJ market from making massive recording desks (which they still do). All their DJs mixers since then have had fewer and simpler mic channels, right down to just level, hi and lo - even on their top of the range model. I'd say the industry sees the need for mic inputs on DJ kit as non essential. What are they though? Cheap and cheerful karaoke mixers, or something up at pro level? So is there a way to adjust vdj 8.2 recording levels? Any options i can try and/or experiment with. Sent a support message to Drnon, spent ages writing it but not sure if it has gone as it just went back to the start screen once i had sent it. I believe i can normalize the track volume using Abode Audition and yhen master it but thats not the point, a unit of this price should work properly. Hi Guys, I'm pulling my hair out on this issue now! I have been speaking to a dj in America who has a similar setup on the mc700p. I have tried everything, i have even reset vdj and it still records - 15db. Running out of ideas now. A call to denon dj support team should probably be next. I am really loathed to flatten my laptop and start from scratch. Any more ideas guys. Never ever had a single problem with the mc6000 mk2 or vdj 8.2 till now. Laptop is optimised, i shut down processes to make laptop quicker etc, virus free and apyware free. Did you try what I suggested in my earlier post? Just read again and i see what you mean now. Do you mean remove the record line and just have Master and Headphone on 1&2 3&4 respectively? Would that then not record the mic as i have to use the mic as well. Many thanks for your help again Grovve.